Rev. Agabus Lartey, pastor of Family Life Fellowship Church in Boston, Massachusetts, left the lights on for his daughter Kristen before going to bed last August. But Kristen, a 22-year-old who had just graduated from college, never came home that night. Instead, she and three other young women were gunned down that evening while sitting in a car on a nearby street. Three of the four women died from their wounds, all victims of senseless—yet, for many Americans, frighteningly frequent—gun violence. Stories such as Kristen’s are all too common in the United States, but they don’t have to be. Millions of Americans have been affected by gun violence in their communities, and millions more are calling for an end to the killing—and their voices are growing louder. In the wake of the tragic mass shooting at Sandy Hook Elementary School in Newtown, Connecticut, last December, an overwhelming majority of Americans called for common-sense gun regulations that could help prevent future killings: Polls show that 91 percent of Americans, including 85 percent of gun owners, support universal background checks for gun purchases. But despite such strong public support, the U.S. Senate failed to pass a series of sensible gun regulations last week—including universal background checks for gun purchases. The Senate’s refusal to act has triggered widespread outrage among gun-violence-prevention advocates. Yet now more than ever, advocates are determined to intensify their efforts to defeat the gun lobby and win common-sense regulations to help make America safer. Faith-based groups have long been key partners in these kinds of efforts, bringing a moral voice, firsthand experience, learned expertise, and strategic know-how to the cause. Together with citizen groups, law-enforcement officials, elected leaders, and survivors of shootings, they are decrying the cowardice of senators who voted down gun laws and calling for sensible regulations that will help curb the epidemic of gun violence that haunts neighborhoods across the country. Below we examine the efforts of faith-based groups to prevent deaths caused by firearms through their work as first-responders, advocates, and prophetic voices against the scourge of gun violence. High-level advocacy by faith-based groups around gun-violence prevention has made headlines in recent weeks, with major news outlets covering protests, vigils, marches, and worship services. Such national coverage provides welcome recognition of faith groups’ key role in this issue, but it only hints at the longstanding work of many faith communities—especially those in urban areas—to reduce gun violence in their neighborhoods. Most of the nation’s 30,000 annual gun deaths never make national headlines but are part of all-too-common cycles of gun violence that plague low-income urban centers across the country. Houses of worship are hubs of refuge, places of service, and centers for community activity, so when members of the community are felled by gun violence, faith leaders and houses of worship are left to manage the tragic aftermath. They counsel traumatized survivors, console bereaved family members, and bury the dead. Local faith communities do more than just provide emotional and spiritual comfort. They have also been key partners in collaborative efforts to address the root causes of gun violence in many American cities. When areas of Boston suffered an onslaught of gang-related homicides in the mid-1990s, local law-enforcement officials launched a series of highly targeted initiatives to strategically combat gun violence in the city. Organizers of the campaign, called “Operation Ceasefire,” recognized that the initiative would only be successful if it developed close partnerships with local public figures, who could rally neighborhoods around the campaign’s efforts. The campaign organizers found an ally in the TenPoint Coalition, a cadre of black clergy that had united against gun violence after a group of Boston gang members stormed a funeral service in May 1992 and attacked mourners with knives and guns. Law-enforcement officials invited pastors of the coalition to serve as public support and on-the-ground assistance for their efforts. Faith leaders provided added moral and organizational resources as the initiative launched targeted actions such as tracking intrastate gun trafficking, arresting and prosecuting traffickers whose guns showed up at crime scenes, and informing local gangs that gun-violence crimes would now trigger an amplified response. Operation Ceasefire was an unqualified success. By 2001, just five years after the project began, the effort was credited with a 63 percent decrease in youth homicides per month, a 32 percent decrease in shots-fired calls per month, a 25 percent decrease in gun assaults per month, and a 44 percent decrease in the number of youth gun assaults per month in Roxbury, Boston’s highest-risk district. The relationship between Boston Police and black clergy was a new mechanism of police accountability that was necessary in order to create trust that new programs would be beneficial to the community. This trust was essential for establishing needed community and political support for innovative efforts by the Boston Police. Collaborations between Boston law enforcement and local clergy quickly became a model for effectively tackling localized gun violence in the United States. When similar Operation Ceasefire-style gun-violence prevention initiatives were launched in Los Angeles, California, and Chicago, Illinois, in the 1990s and early 2000s, leaders from the TenPoint Coalition were brought in to offer training for local clergy and to reiterate the need for strong partnerships between religious leaders and program organizers. Indeed, although the number of gun killings in Boston has risen in recent years, researchers at Harvard University posit that the uptick in violence is at least partly due to waning relationships between law-enforcement officials and faith groups—relationships that Boston leaders are now actively re-establishing. In the absence of heavily resourced programs such as Operation Ceasefire in other cities, faith groups have leveraged the power of protest and community clout to reduce gun violence. When Philadelphia experienced waves of gun violence in 2008, local residents were initially at a loss. News broke later, however, that a local firearms distributor, Colosimo’s gun shop, was the leading source of guns recovered at local crime scenes. The shop was allegedly complicit in the practice of “straw purchasing”—when an individual who cannot legally purchase a firearm enlists a third party to buy it for them. Outraged by the news, local activist Bryan Miller gathered 12 faith leaders from various Christian and Jewish traditions and staged a sit-in at Colosimo’s gun shop in January 2009. Before being arrested, the protestors urged the store’s owner, James Colosimo, to sign a “Gun Dealer Code of Conduct,” a document developed by the larger advocacy group Mayors Against Illegal Guns, which includes a prohibition against straw purchasing. The owner refused. Undaunted, the activists recruited more local denizens, renamed their group “Heeding God’s Call,” and continued to perform acts of civil disobedience for several months. They partnered with local community coalitions and facilitated weekly “witness” vigils in front of the shop to ensure the story wouldn’t fade from the local press. The prayerful diligence worked. Nine months after the initial sit-in, the U.S. Attorney’s Office brought charges against Colosimo’s gun shop and eventually revoked the owner’s license to sell firearms. Energized by their success, Heeding God’s Call has since expanded to surrounding communities, helping other faith groups start chapters in Baltimore, Maryland; Harrisburg, Pennsylvania; and Washington, D.C., and encouraging them to use similar protest tactics to quell violence in their own cities. Members of Heeding God’s Call are not unique in responding to local instances of gun violence with faithful witness. In response to the thousands of shootings that ravaged Chicago in 2011 and 2012, Episcopal leaders in the city organized CROSSwalk, an annual procession in downtown Chicago that started before Easter last year to remember the victims of gun violence and support efforts to stop the killing. Last year’s event, which garnered around 1,500 participants, has evolved into an ongoing project for the Episcopal Diocese of Chicago and boasted similar numbers of participants at a repeat performance of the vigil last month. Organizers are working to turn the energy into legislative change: They used the publicity surrounding the vigil to fuel a gun-violence prevention lobbying day on April 11 in Springfield, Illinois, where CROSSwalk participants held rallies and met with state lawmakers. Participants sought to remind political decision makers that while mass shootings such as last year’s massacre in Aurora, Colorado, spark national outcry, the public attention misses the less dramatic but far more common shootings that plague urban America. America’s religious landscape is strikingly diverse, yet faith groups increasingly agree that there is a religious imperative to prevent gun violence—especially when it comes to provisions such as banning assault weapons and instituting universal background checks. Recent polls have shown an uptick in support for gun-violence prevention legislation across the country, and religious Americans are no exception. A recent survey conducted by the Public Religion Research Institute found increased levels of support among religious groups for stricter gun laws after the Newtown massacre, with support among white mainline Protestants jumping 15 percentage points from 42 percent in August 2012 to 57 percent in January 2013. Catholics also saw a small jump in support, with 67 percent supporting stricter gun laws in January compared to 62 percent last August. And while white evangelical Protestants are the most likely group to live in a household where at least one person owns a gun, they appear to be undergoing a dramatic shift on the issue as well—at least within their leadership. Although an August 2012 Public Religion Research Institute poll showed that only 35 percent of white evangelicals support stricter gun laws as a whole, a January 2013 survey conducted by the National Association of Evangelicals found that 73 percent of evangelical leaders say the government should increase gun regulations. A change in attitudes behind gun-violence prevention is also showing up in the speeches, sermons, and homilies of religious leadership. Faith leaders across the theological spectrum are speaking out on gun-violence prevention, grounding their positions in a shared faith. Each of the three Abrahamic traditions we represent has at its core the belief that every life is precious and sacred and that each person bears the image of God. … We urge each person of faith to contact their elected official and call upon those officials themselves to begin to put their own moral convictions at the center of their decision making on this matter. Interfaith cooperation is helping create a unified, faith-based argument for legislation to stop gun violence. Faith-based social justice groups such as PICO National Network and Sojourners hosted a rally in Washington, D.C., on April 11 that featured faith leaders from diverse religious traditions. In addition to remarks from Christian and Jewish leaders, the event included representatives from the Sikh community who spoke of how the tragic shooting at a Sikh temple in Oak Creek, Wisconsin, last August rallied their religious community around the issue of gun violence. 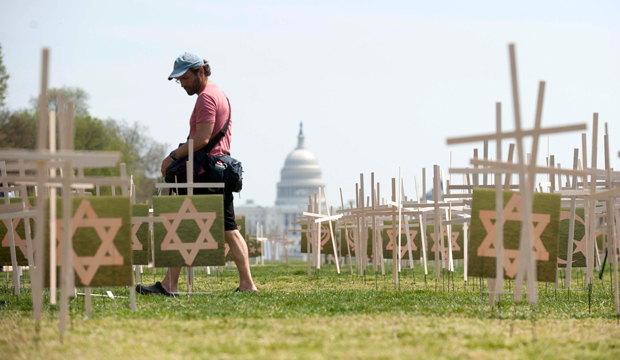 Organizers also erected a graveyard of crosses, Stars of David, Khandas, and other religious symbols to symbolize the 3,364 gun deaths in the United States that have occurred since the Newtown shooting. In addition to personal encounters with tragic killings and the belief that gun violence is an inherently religious issue, religious leaders are also working to help pass legislation to prevent gun violence because they recognize faith groups as one of the few institutions with the organizational and moral wherewithal to counter the powerful influence of pro-gun lobbyists. The National Rifle Association, or NRA, is considered one of the most influential lobbying groups in the nation. NRA lobbyists leverage the power of their more than 4.2 million members to hold sway over lawmakers and make ample use of the organization’s astoundingly deep pockets. The NRA rakes in millions of dollars from wealthy corporate donors annually and outspends its opposition by powers of 10 during election cycles; it spent almost $20 million on outside spending in 2012 alone. Meanwhile, Gun Owners of America, a lobbying group even more extremist than the NRA, has become an increasingly powerful player inside Washington. The group has reportedly forced some Republican lawmakers to back out of recent negotiations that would create bipartisan support for federal gun-violence prevention legislation. In the face of such daunting opposition, it is tempting to conclude that gun legislation supporters are outmatched. But what the NRA and their allies wield in financial capital, faith groups can counter with something else: moral capital. Indeed, although the “cross lobby” and other interfaith coalitions cannot match the NRA’s massive fundraising machine, they can claim people power. The coalition Faiths United to Prevent Gun Violence, for instance, includes 46 religious organizations, faith-based institutions, and denominations that collectively represent tens of millions of Americans. And the National Council of Churches—which has held coordinated public events mourning the deaths of the 26 children killed in the Newtown shooting and has since distributed materials decrying gun violence—represents roughly 45 million people from more than 100,000 local congregations in communities across the nation. In addition to their numbers, religious institutions have built-in advocacy mechanisms that bolster larger coordinated efforts. Following the tragic killings in Newtown, for instance, the Washington National Cathedral partnered with two other churches and One Million Moms for Gun Control in January to organize the “March on Washington for Gun Control,” gathering thousands of people on the National Mall—including 100 individuals from Newtown—to demand an end to gun violence. Similarly, the Religious Action Center of Reform Judaism spearheaded a “Faiths Calling” campaign on February 4 that flooded Washington lawmakers with tens of thousands of calls demanding they take action on gun violence. The campaign was repeated on April 9 with similar results and received widespread support from a diverse set of religious participants such as the Presbyterian Church (USA), the Islamic Society of North America, the Sikh Council on Religion and Education, and many others. In mid-March, a broad consortium of faith-based groups, including the Lifelines to Healing Campaign, convened a national “Gun Violence Prevention Sabbath,” where hundreds of churches and faith-based groups across the country hosted worship services, rallies, and panel discussions to bring attention to senseless killings. The Sabbath received local and national media attention, granting the issue greater exposure and highlighting the religious and moral imperative of ending gun violence. Despite the loss in the Senate, faith leaders and advocates are intensifying their efforts, promising that they will urge their congregations, communities, and all people of goodwill to push elected officials to pass gun laws that make communities safer. The challenge set before faith-based advocates is of David and Goliath proportions, but religious organizations—united by their spiritual fervor and empowered by their partnerships with other advocates—are still hoping to muster the moral imperative and political will needed to pass federal legislation to prevent gun violence. The indiscriminate distribution of guns is an offense against God and humanity. Our gun-flooded, violence-prone society has turned weapons into idols. And the appropriate religious response to idolatry is sustained moral outrage. When the parents across America start crying out for effective action, if there’s religious leadership, it will galvanize the community to create the moral demand that moves toward sensible legislation. As hundreds of mourners gathered in Jubilee Christian Church in Mattapan, Massachussetts, to mourn the death of Kristen Lartey last August, the sanctuary brimmed with tears, sadness, and sobs of grief. Participants remembered Kristen as a vibrant and lively young woman whose life was cut short by a senseless act of gun violence. Yet in the midst of anguish, a call to action emerged—and a glimmer of hope. Similar to Ricketts, faith leaders, religious groups, and Americans as a whole know that stories such as Kristen’s don’t have to be the norm, and they recognize that common-sense legislation can help end the cycles of violence that plague cities across the country. Despite the Senate’s disappointing decision to strike down legislation that would have enacted universal background checks for gun purchases, secular and faith-based advocates will press on together to persuade officials at the federal, state, and local levels to address issues of gun violence. Advocates will continue to push laws that would help end gun violence such as a ban on assault weapons, universal background checks, making gun trafficking a federal crime, and reforming the Bureau of Alcohol, Tobacco, Firearms and Explosives that oversees many aspects of gun regulation. Indeed, in the aftermath of tragedies such as the shooting at Sandy Hook Elementary School in Newtown, Connecticut, Americans—both religious and nonreligious alike—resonate with faith leaders such as Ricketts who declare that we are “not the same anymore.” In the midst of grief and frustration, it is imperative that Americans unify voices and advocacy efforts to demand that lawmakers pass common-sense gun-violence prevention legislation. Jack Jenkins is a Writer and Researcher with the Faith and Progressive Policy Initiative at the Center for American Progress. Eleni Towns is a Research Associate with the Faith and Progressive Policy Initiative. For more on this initiative, please see its project page.